No. It is a character from the epic Ramkien. At glitzy malls and street shops selling Thai merchandise, amidst the Thai masks that are purchased by tourists as souvenirs, sits firmly ensconced a golden-faced figurine of an epic character that may seem quintessentially Thai. The name, the face, the art form, the colours and the style indicate a tradition that has made Thai art famous all over. Peer over the statue, and the label says: "Thotsakan". Thai legends inform us that Thotsakan is a character from the epics, who fell in love with Sida (Sita), wife of Phra Rama. Thotsakan kidnaps Sida, leading to a huge war between demons and humans. Thotsakan is the king of demons with ten heads, and with his 20 arms possesses innumerable weapons and stoutly believes in his invincibility. Further, Phra Rama is revered as an incarnation of Pra Narai, and he is the son of King Tosarot of Ayothaya. Yes, Thotsakan in how Ravana is addressed in Thailand, and he is one of the main characters of Thailand's nation epic Ramkien, or the Glory of Rama. Tosarot rhymes with Dasharatha, Ayothaya with Ayodhya, and Narai with Narayana (or Vishnu) indicating how the epic travelled to this region and acquired a local flavour. Among the many similarities with the Hindu epic Ramayana include the centrality of the Hindu god Rama, his wife Sita, the demon king Ravana, and the capital city of Ayodhya. In Thailand, Ayutthaya is a province north of Bangkok, whose ruins are now a UNESCO Heritage Site. Traditionally called Ayothaya, it became the capital of Thailand in the beginning of the 14th century. For the next four centuries, it served as the Thai capital before being destroyed by the Burmese army, following which the Thai capital shifted to Bangkok. However, the similarities seem to end here. In Thailand, Thotsakan is treated as a part of art, literature and culture. It is a character of an epic, rather than a religious figure. Unlike India, where Dussehra marks the victory of Rama over Ravana, and is characterised by burning of effigies, such celebrations are absent in Thailand. In fact, depiction of death is frowned upon. The concept of burning of an effigy remains alien, and Thai people express their surprise at this "Indian tradition". A controversy arose in 2006 when the on-stage depiction of Thotsakan's death was considered a bad omen, and was censored by the Thai government. Famous author-composer Somtow Papinian Sucharitkul, who had created the opera "Ayodhya," was forced to withdraw the scene of Thotsakan's death leading to a debate on the issue of freedom of expression. Thotsakan is however, a very strong influence in Thai art, culture, dance and drama. The Khon form of dance in Thailand often has the demon king as a primal character. A highly stylised genre of dance, Khon includes depiction of demons and simians (recall Hanuman's vanar sena). The Khon dance legend draws heavily from the epic war between the righteous King Rama and the ten-headed demon who kidnapped his wife. Thotsakan is conspicuous due to his headgear and his depiction is indicative of his hierarchy among the demons. Thotsakan's masks and dramatic depictions can be found across various art forms in Thailand. A painting in Bangkok's holy Wat Phra Kaew Temple has scenes of the Ramakien epic. And at edges of the temple within the famous Grand Palace complex, his statue with its giant physique is uniquely positioned, as if guarding the huge temple complex. And, if after a trip to Bangkok, you are about to depart at the Suvarnabhumi Airport. Walk halfway through the departure lounge and gaze at the massive golden statue laced with red and green filigree. Read the caption below the statue and it identifies him as Tosakanth (another name for Thotsakan) or Ravana, with a description of his ten heads and a narration of an incident from the epic. 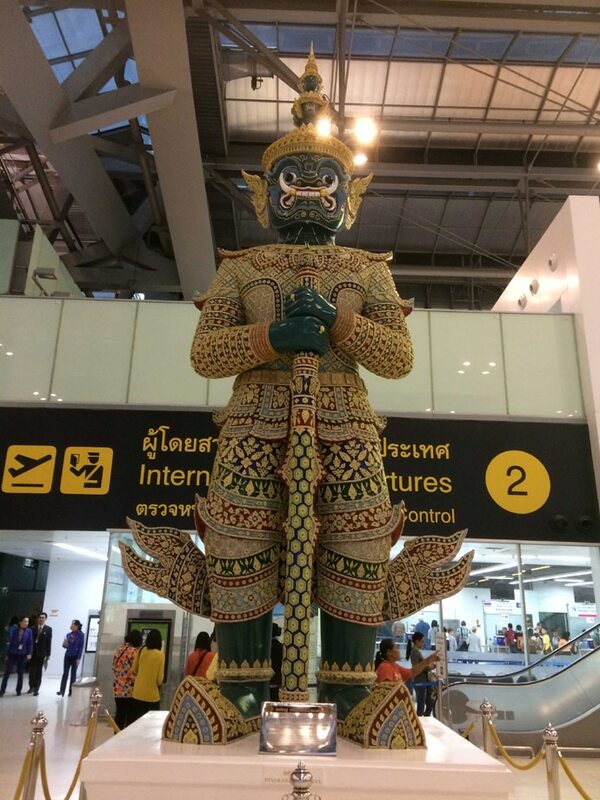 You are assured of a safe journey, because at this airport, Ravana, as in the rest of Thailand has a different avatar. Here it is Thotsakan, and he is a demon king who guards.